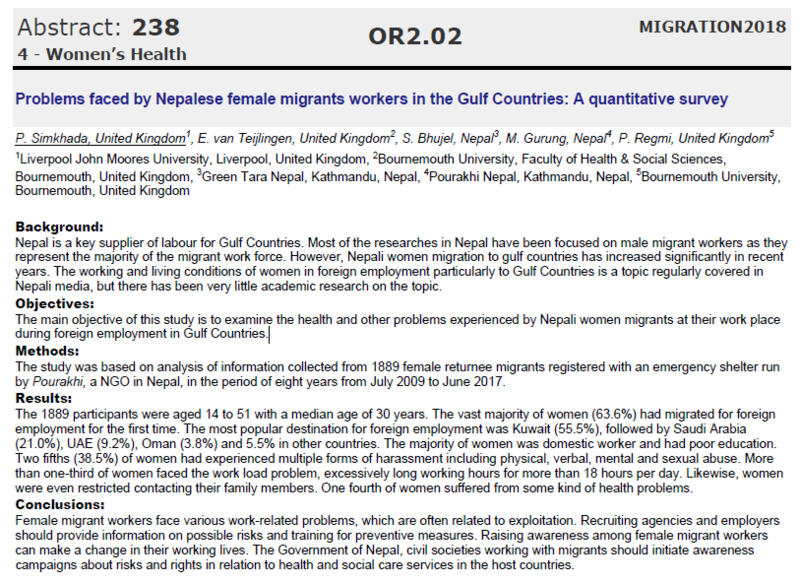 Two days ago Bournemouth University Visiting Professor Padam Simkhada presented our paper ‘Problems faced by Nepalese female migrants workers in the Gulf Countries: A quantitative survey’ at the International Conference on Migration Health in Rome, Italy . 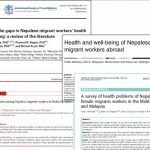 The study reports on the health and other problems experienced by Nepali women migrants at their work place during foreign employment in Gulf Countries. The paper is building on earlier research with the charity Pourakhi in Kathmandu which helps women who return from working abroad in trouble. The first paper was publish earlier this year in the journal BMC International Health & Human Rights . The conference presentation was co-authored with BU’s Dr. Pramod Regmi and Prof. Edwin van Teijlingen, Ms. Manju Gurung from Pourakhi, Ms. Samjhana Bhujel from Green Tara Nepal, and Padam Simkhada, who is professor in the Public Health Institute at Liverpool John Moores University.